Unfortunately, there are scammers who are banking on the fact that you might pay a lot of money to protect that domain or to get it back if you were to lose it. Knowing how to tell these scams apart from legitimate domain requests could save you a lot of time and money! 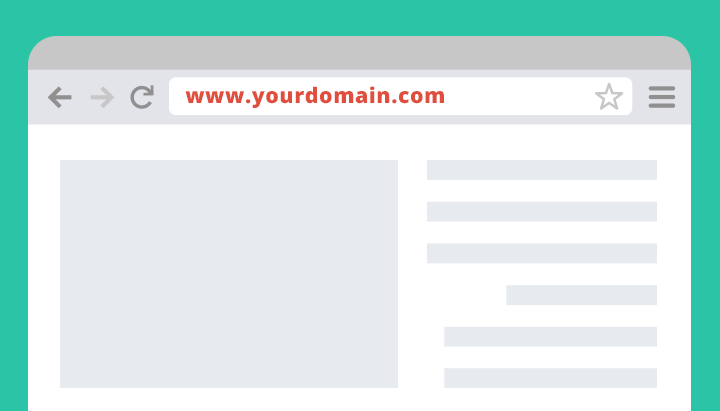 Annual Website Domain Listing – This common scam encourages you to pay $200+ to list your domain publicly in a directory to attract clients. This is not a marketing tactic that we would recommend as very few customers are using these directories to search for a domain. These directories don’t provide any additional value to your digital marketing strategies in the same way a link building service, which is included in our Premium SEO package, would. Click here to see an example of this type of scam. iDNS and Domain Slamming – iDNS is a company that commonly participates in domain slamming, which is attempting to get you to give up control of your domain name by transferring the registration. Customers report receiving physical mail or emails that look like bills “alerting” the customer that their domain is about to expire. Once the domain has been transferred, the scammers can take the website down and then attempt to charge you even more money to gain control of it again. Click here to see an example of this type of scam. Chinese Domain Registration Scam – As a small local business, the idea that you might want to register your domain in China probably seems a little strange and with good reason! These scams encourage you to prevent someone from stealing your intellectual property by registering your domain name in China before they can. This isn’t necessary and these companies are rarely legitimate domain registrars in China. The first step to protecting yourself against requests like this is to recognize the scams when they show up in your inbox. Just delete those requests or throw out those letters! Know who your domain registrar is so when legitimate emails about your domain come through, you can respond to them appropriately. Not sure if you’ve received a legitimate request or not? Scam letters will often include small print somewhere stating “This is not a bill.” You can also send any letters you receive to your AudiologyDesign account manager and we will review it for you! Finally, since AudiologyDesign hosts your website, you always have the option to transfer your domain to us at no additional cost. The benefits of transferring a domain to AudiologyDesign are that we maintain the domain and automatically update the registration. If you transfer your domain to us, you retain ownership of that domain and it can be transferred back to your account at any time. Will AudiologyDesign Ever Ask for Domain Access? If you have decided to maintain your own domain, AudiologyDesign will very rarely request access to your domain to change nameservers. That request will always come from your dedicated account manager and we’ll always explain exactly why we need access. We’ll also give you the option to make the changes by providing detailed instructions. Even if your domain is held by AudiologyDesign for you, you can still edit your domain to control your email settings, for example. You have 24/7 access through our Content Management System. For more information on how to access your DNS, reach out to your dedicated account manager for a quick tutorial!